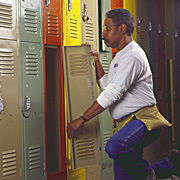 Restore your lockers to first class condition at a fraction of the cost of replacement! Tightening and replacing loose/missing nuts and bolts. Aligning locker doors for ease in opening and closing; replacing those that are either missing or irreparable. Securing loose shelves and other parts. And equally important, we properly prepare the old surface and refinish your lockers with a tough, new coating that we apply electrostatically. Summertime is certainly the busiest season for Locker Renovations. But we renovate lockers in schools year 'round! Our crews work during the evening, on weekends, or at other times convenient to your schedule. It's a process we've perfected throughout our thirty-plus year history! Read on to learn how our electrostatic painting process combined with fast-drying coating materials make this possible for you! ELECTROSTATIC PAINTING: WHAT IS IT AND HOW DOES IT WORK? It’s quite simple, really. Our aim is to eliminate wasteful overspray and get as much coating material on the target as possible. This is achieved by negatively charging atomized paint particles so that they are attracted to the steel lockers in your school. Opposites attract! A charging electrode is located at the tip of the electrostatic spray gun or atomizer. The paint is atomized as it moves past the electrode, and its particles become ionized – negatively charged. An electrostatic field is created between the charging electrode and the grounded lockers, and the spray is concentrated within it. Further atomization is achieved as charged particles repel each other to form a fine cloud. As a result of electrostatic attraction, spray that would normally be lost ends up on the back and sides of the work piece to produce a "wrap-around" effect. Electrostatics is an environmentally responsible way to atomize paint, because it significantly increases quality and production while equally decreasing paint costs, maintenance, and emissions of volatile organic compounds (VOC’s). When you want to achieve maximum transfer efficiency and minimize coating waste and VOC emissions, while achieving maximum paint wrap, high production and high flow rates. It is our ability to employ an electrostatic process that enables us to paint your lockers indoors, without first removing them from your school. 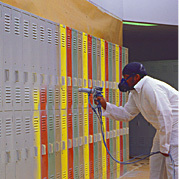 Our controlled electrostatic painting system is efficient and clean, and lockers we paint over the course of an evening can be used the next day! Manufacturers of built-in locker locks produce their products with multiple combination settings for each lock. Both PHP Locker Company and the lock manufacturers strongly recommend that your locker lock combinations be changed every summer to prevent users from entering the lockers they used the previous school year. It is in this way that you maintain the security of your installation. 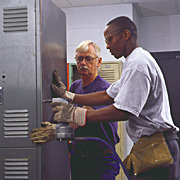 Making minor repairs and adjustments to your lockers so they are ready to use when school starts in the fall. A new lock control chart every year. Student Locker Issue Cards (SLIC) for every locker. Don’t try to manage your locker installation by yourself! Call PHP and get on top of your locks and lockers today! PHP Locker Company chooses to align itself with Republic Storage Systems as a value added distributor. One of the oldest and most well-respected manufacturers of lockers and storage products in the United States. 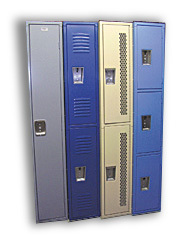 Republic offers a complete line of lockers for schools, athletic rooms, clubs, park and recreation areas, offices, and industrial locker rooms. Republic lockers have proven to be easier to install and more trouble-free than any other system on the market. Available in a variety of configurations, they feature reliable latching systems and a premium finish. Choose from twenty-five standard colors and hundreds of size and style combinations to suit your needs precisely. We recognize that it’s usually not enough just to buy the right product. Although some end users will install lockers themselves, most of our customers rely on us for competent and professional installation. We use only our own experienced and thoroughly trained professional installers and the best installation subcontractors to get your job, big or small, done right and on-time! Looking for used lockers? We have a wide selection of brand, types, sizes and colors in stock for immediate shipment! Call now! One of our friendly associates will be glad to help you find the product that meets your needs…at an affordable price! PHP Locker Company is a proud distributor of Master Lock Company products. Master is the premier manufacturer of locks for lockers in the United States. There are two basic types of locks that are most commonly used with lockers: Built-in combination locks and combination padlocks. However,there are different models of each. The model you need depends on the type of locker you have. Training videos for some of Master Lock Company’s most widely distributed Locker Locks are available for you to view here. Master products are available for quick shipment at low prices. Call now for information and to place your order!